Meterlink - this camera can link wirelessly to selected Extech test instruments and the data from them can be included on the IR image. Bluetooth enabled voice annotation, record up to 60 seconds of voice annotation per image via a Bluetooth headset. New Instant Report Feature - create a pdf report instantly from the camera, which can then be copied to a USB stick or PC to share with the customer. The FLIR T620bx is supplied with 25° Lens, SD Memory Card, 2 x Li-Ion Rechargeable Batteries & AC Adaptor, 2 Bay Battery Charger, Flir Tools Software, USB Mini-B Cable, Video Cable, Stylus Pen, Bluetooth Headset, Lens Cap, Calibration Certificate & Hard Carry Case. FLIR leads the way in forward thinking Wi-Fi connectivity to mobile devices like iPad, iPhone and iPod Touch. Just download the new FLIR Vierwer app from the apple store and you're ready to import images from the camera. FLIR QuickReport Software is also available in a free download, allows users to organise and analyse the radiometric images from its infrared cameras and present them in a report in just three easy steps. 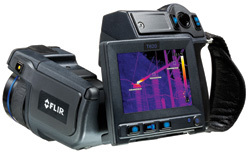 FLIR Reporter is powerful software for creating compelling and professional reports with new TripleFusion, Picture-in-Picture and the latest Microsoft operating system and Word compatibility. A 30 day free trial version is available to download or the Reporter Pro CD can be purchased for €250.00 (ex-VAT) and comes with two unlock keys (single license) or for €150 (ex-VAT) you can get a single install code and the software can be downloaded from the web.